The show is up at Mount Ida College Gallery so if you're in the area check it out and let me know what you think. 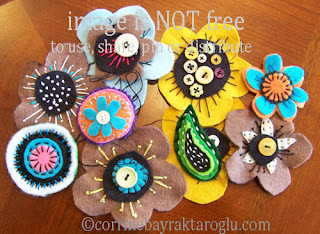 The flower is one of the actual felt flowers I made, long & short stitch and french knots. 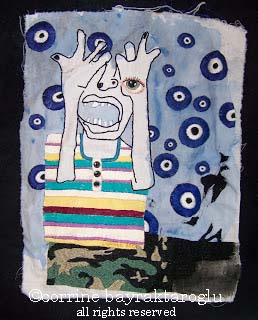 To see more of my embroidery check here. The Yum Yum Pole on Dayton Street continues to be one of my faves that we (jafagirls) did. 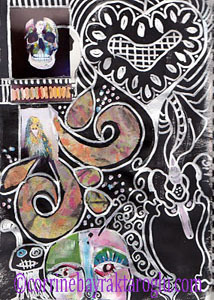 A mess as usual, and I spent hours drawing out a new embroidery piece and don't like it, arg! I have yarn up to me eyeballs, felt up to me eyeballs, paints everywhere, I LOVE it! I have this silver ink pen that just flows and I wanted to sribble and doodle with it. Sometimes mindless doodling is such fun. 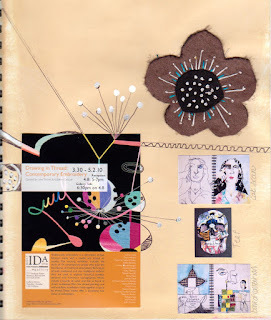 I've also learned that down the road I often come back to a sketchbook page and find parts I can use in a painting or an embroidery. Craft Gossip has a lovely article about Carolyn Saxby's Textile Art Sketchbook, which I thorougly enjoyed. Went to the movies in Ann Arbor St.Patricks Day and what a treat to not only see such a GRAND old movie palace, Michigan Theater, but we were also treated to some organ music on the original Barton Theatre organ. Here is a tiny sample. 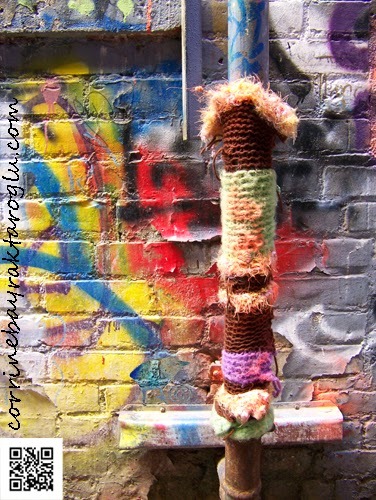 Takes us about 3 hours to drive to Ann Arbor and managed to get some crochet/knit done for some new textile graffiti. This is for the central portion of a bench on Dayton Street in Yellow Springs, felt flowers will be added either end. Nancy and I have also been working on flowers and leaves for a new piece for Elaine's Bench on Corry Street. Flower Power must be really in because I went to Target and saw that they now carry Liberty of London. It was, is, a very posh/hip store and their flower prints were very BIG in the 60's and 70's. I could NOT resist this teapot. "Will The Runaways' '70s Fashions Come Back In Style?" I think yes with a modern take on it, however I don't think you would see this in a current craft mag nowadays. The first thing we did when we arrived was go to our fave alley(graffiti alley) and put up some jafagirl art. You can hardly see it from a distance which really like. 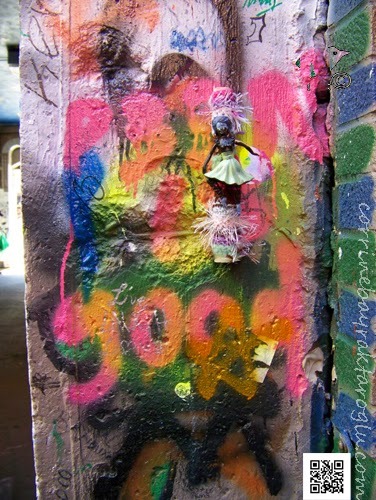 I was really suprised to see last years yarnbombing still up, although the doll had been ripped off. I finished this embroidery but just have't figured out how to mount it. I have dreamed ideas and thought about ideas up to the eyeballs. The tantalizing part is I know what I want but can't quite figure it out technically. I know I want it stapled to something. 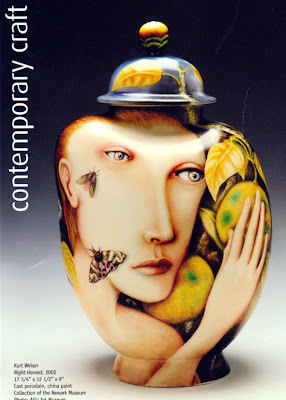 Visited the Society for Contemporary Craft in Pittsburg over the weekend and saw the beautiful work of Kurt Wieser. I so wish there had been seating in the exhibit space like in some of the small msueums I've visited. Being able to sit for a wee while really helps to spend time with art and explore and enjoy it. Nancy and I put in a new piece (made by Nancy) for the art box on corry street. I kind of get a kick out of this but it's amazing how many people in town have never noticed it, kind of like the nose above the sweetie shop. They quietly exist and become a suprise when people actually notice them. In between working on embroidery, life drawing, and a few other things I'm starting to work with the other jafagirls (Nancy and Karen aka jafalass) on making felt flowers for a textile graffiti project. We are trying to make them simple, which is NOT working because our urge to prettyfy is too strong, LOL! In looking at the definition it doesn't seem what we are doing fits exactly. Having said that I do I feel we are using crafts in a social setting that puts them into a different context. It may not be shocking to the senses or didactic in nature, nor the work itself exceptionally original, BUT there is something to be said about work that provokes a different viewpoint. 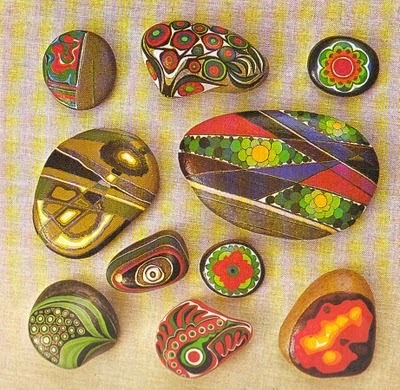 I love the colours and patterns on these stones. I guess you can tell I am INTO colour today.